Ron Paseka serves as the Fraternal Secretary for FCSLA Branch W-013 in Prague, Nebraska. He has been an FCSLA member, officer, and Licensed Insurance Agent for many years. Ron is very involved in FCSLA at the District Level as well. He currently serves as the District Treasurer. He organizes the Nebraska District Summer Picnic in North Bend every year. He manages the Nebraska District Christmas Party held in Prague each December. Ron also has served on the National FCSLA Court of Appeals. Ron and his wife Deb attend the National Conventions held every four years, serving as Delegates and they both represent our local and district chapters well. He is a strong advocate for FCSLA at the local, District and National levels. Ron is instrumental and involved in every one of Branch W-013 sponsored activities. Branch W-013 is very active, and Ron is at the forefront in managing and assisting with ALL of the events. Every year our Branch has participated in the Matching Funds program by sponsoring projects / events. The Branch holds an Annual Member Meeting and Breakfast each January to approximately 100 members. An annual Fall Family Picnic is sponsored and held at our local Czechland Lake Picnic Area. W-013 sponsors both the Adult and Youth Christmas Party for its members. They also hold quarterly meetings along with Parish Breakfasts. Ron is the first one to help with organizing and running each of these events. He promotes the Scholarship Program and other FCSLA activities as well. Branch W-013 membership has grown steadily because of Ron's enthusiasm and devotion to FCSLA. His dedication and commitment to our local FCSLA branch is inspiring and invaluable. Prior to his FCSLA membership, he was a Catholic Workman member, Officer and Fraternalist. He served on the Board of Directors for The Catholic Workman for more than 15 years. Ron devotes substantial time in volunteer service to his community, church, and schools. He helps organize the Annual Food Drive for our county's food bank each fall. He has led the way whenever W-013 has made donations to various communities in need of disaster relief. Ron proudly served his Nation honorably in the United States Navy, serving overseas and in Vietnam. Ron is a proud member of the Local American Legion Post 254, and has served as a past Commander. The Legion Post has sponsored benefits to help raise funds for the Veterans Honor Flight to Washington DC. Ron was chosen to attend one of the Vietnam Veteran's Honor Flight in May, 2017. 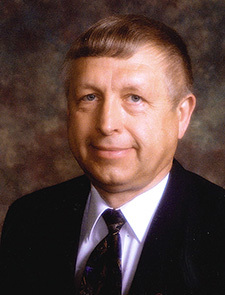 Ron has served on the Village Board of Prague for many years. He is a volunteer for many local events sponsored by our small town, especially during our Prague Days held each August. An example of this is the annual Lunch Stand that he helped to organize and work at during the town's Polka Festivals. Ron & Deb put in many hours of volunteer work, helping to provide valuable community service. The proceeds raised during these events are donated to our church and community. Ron is a member of the Knights of Columbus John Paul II Council, and volunteers with many of their activities. He is a retired member of the Prague Fire Department, and has earned an award for his service of 40 years as a firefighter and officer. He also served as an EMT with the Rescue Squad and was awarded a plaque for 30 years of service. He is also a retired member of the Prague Jaycee's, where he organized and participated in many local events throughout the years. Ron is a lifetime member of St. John's Catholic Church in Prague, where he has served as a Lector, Trustee, Men's Group Captain, and Parish Council Member. He currently is an Acolyte and Bazaar Auction Chairman. He serves on the local Diocesan Development Program, helping with the annual donation drive. Ron's leadership is crucial because of his positive, 'Can-Do'attitude. Ron has provided leadership and been instrumental in outreach programs, getting neighboring communities involved with FCSLA programs. He has assisted neighboring FCSLA branches, with things such as membership drives and Matching Funds projects. Ron is always willing to lend a hand in any event. One of the Matching Funds Projects done by branch W-013 is to provide a lunch stand at the communities' 'Beat Breast Cancer - Mud Volleyball Tournament' every summer. This event attracts several thousand young and 'young at heart' people, and Ron always volunteers to work where needed, in spite of the often hot and humid weather conditions. Many young people get to see FCSLA in action, providing a great community service. This helps with bridging the gap between all generations. Ron has been a Parish Bingo chairman for more than 3 decades. He continues to run and work for the bi-weekly Bingo Night, which helps generate revenue for our parish. Recently it was decided to make some changes to the Bingo program, to encourage more participation and to appeal to a larger crowd. Ron organized the committee that met to brainstorm ways to rejuvenate this fundraiser. The committee has implemented some changes and has helped to revitalize this program, and has become more profitable for the parish. Ron is on the Bazaar Auction Committee, and every year countless hours go into organizing and managing this event. Ron works with the committee to try to make improvements to be more profitable, and to reach out to more parishioners and visitors during our annual bazaar. We have seen steady improvements in our fundraising during this event, largely because of Ron's dedication to the success of this activity. Branch W-013 works closely with their parish, and has helped with many projects such as procuring new Church Hymnals, making repairs to the Church, rectory, and Parish Hall buildings, and Ron is the one leading the way with many these projects. A project that is currently underway is the completion of our parish rectory basement, and replacement of our church's front entry doors. He volunteers with maintenance and upkeep with his church and parish hall, many times behind the scenes, without being asked or recognized. You can always count on Ron to lead the way and lend a helping hand. Ron lives out his Catholic faith by being generous with his time, talent, and treasure in everything that he does. He truly goes above and beyond in service to others and is always ready to help out in whatever is needed. He is dedicated and devoted to his wife and family, his church and community, and to his country. His positive attitude is evident as he provides service to God and others. Ron and Deb Paseka have been married for 46 years, and have 5 children and 8 grandchildren. All are members of the Prague FCSLA Branch W-013. Ron is the perfect example of an outstanding leader and how a fraternalist should live out their faith.